New Hyund ai ad campaign doesn’t say much but it sure says alot! If you had to describe in words how great it feels to drive, could you do it? No? We couldn’t either. And apparently we’re all in good company because Hyundai doesn’t bother with much pesky verbage in its new ad campaign. Instead, the company went with the “a picture is worth a thousand words” concept. And it’s a beaut! 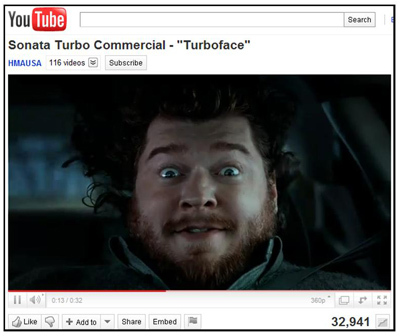 Tell us what you think about the new Turbo Face ads (start here: http://www.youtube.com/watch?v=4va2s6w4nFE)… We bet you can at least come up with the words to do that! Previous Previous post: Special Offers For Special People! Next Next post: Why People Are Talking About Hyundai! !